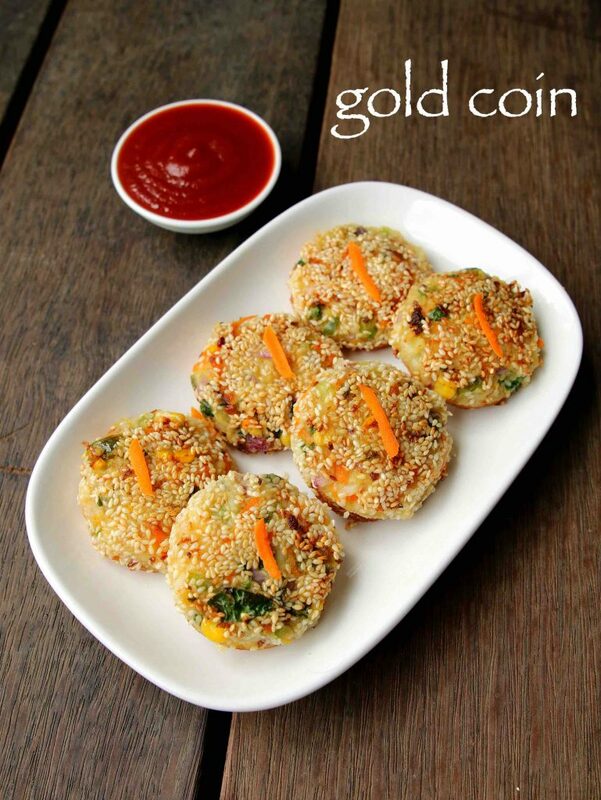 veg gold coin recipe | vegetable gold coins | chinese gold coins with detailed photo and video recipe. 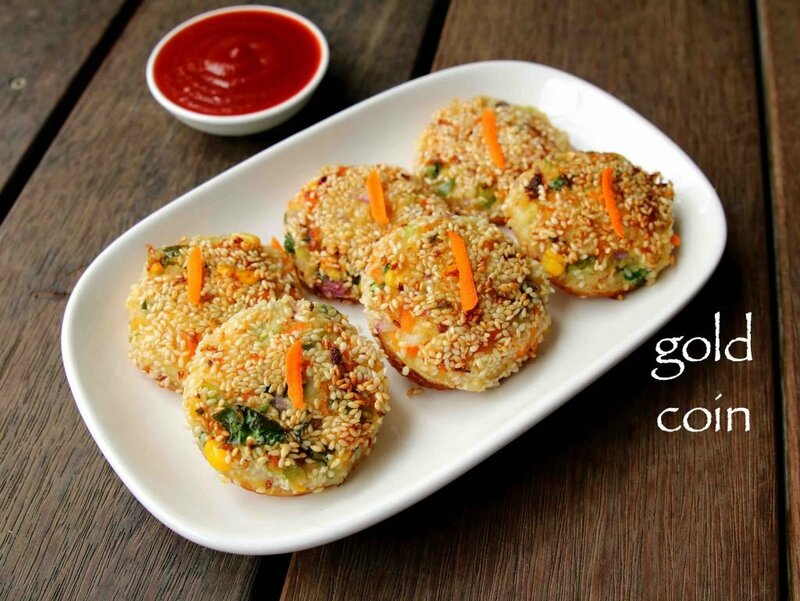 a simple indo chinese snacks recipe prepared mainly with round bread piece with spiced mixed vegetable topping. it is an ideal party starters or an appetizer which would be loved by kids and adults. typically these fried snacks are served with tomato ketchup but tastes good without any side condiments or dips. 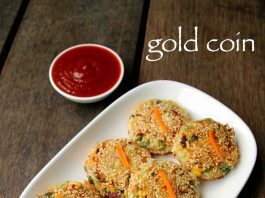 veg gold coin recipe | vegetable gold coins | chinese gold coins with step by step photo and video recipe. a popular urban restaurants snack recipe which typically lies on the indo chinese section of restaurants menu. these deep fried bread snacks are generally topped and coated with white sesame seeds along with spiced mix vegetables. typically these are deep fried in oil which gives it a golden brown colour and hence gives the name to the recipe. even though indo chinese recipes are my personal favourite and i try to keep myself updated with the latest recipes under this section. but veg gold coin recipe was exception and i was totally clueless about this popular snack recipe. i came to know about this recipe only during my recent india trip and i was amazed to see this recipe name in one of the restaurants menu. without any hesitation i had to order this snack and was elated with its simplicity and taste. moreover it was not baffling recipe and i was able to decode it easily without any problems. in addition i ensured to get all the do and dont’s about the recipe as i had already planned to release in my blog. 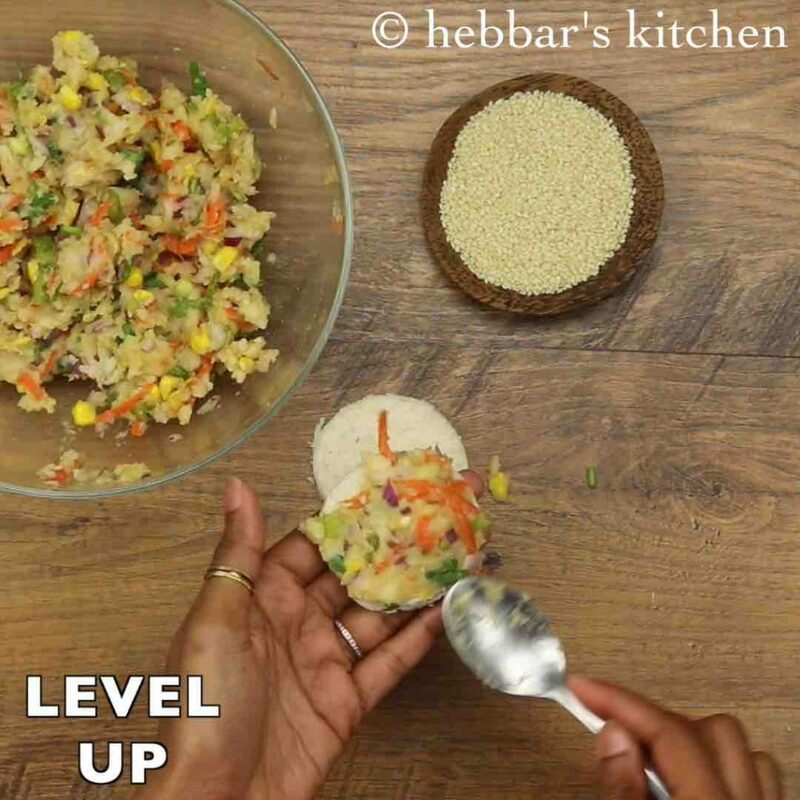 furthermore some tips, recommendations and serving suggestion to this crisp veg gold coin recipe. firstly i have used normal white bread used for day to day sandwich recipes or for bread toast. alternatively if you are health conscious you should be good using brown or multi-grain breads. secondly, these gold coins can always be deep fried or pan fried till it is crisp. but ensure the flame is kept in low to medium so that vegetable gold coins cooks evenly. finally chinese gold coins tastes amazing when served with tomato ketchup sauce or eggless mayo. in addition it can also be served with green chutney or dahi chutney which should make it more flavourful. 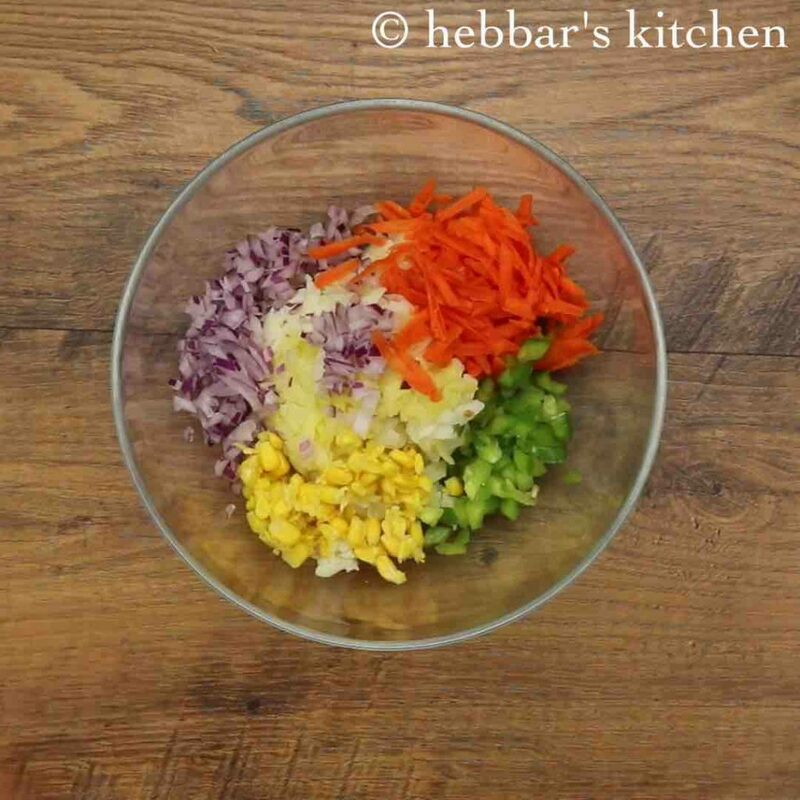 firstly, in a large mixing bowl take 2 boiled potato, 2 tbsp onion, 2 tbsp carrot, 2 tbsp capsicum and 1 tbsp boiled corn. 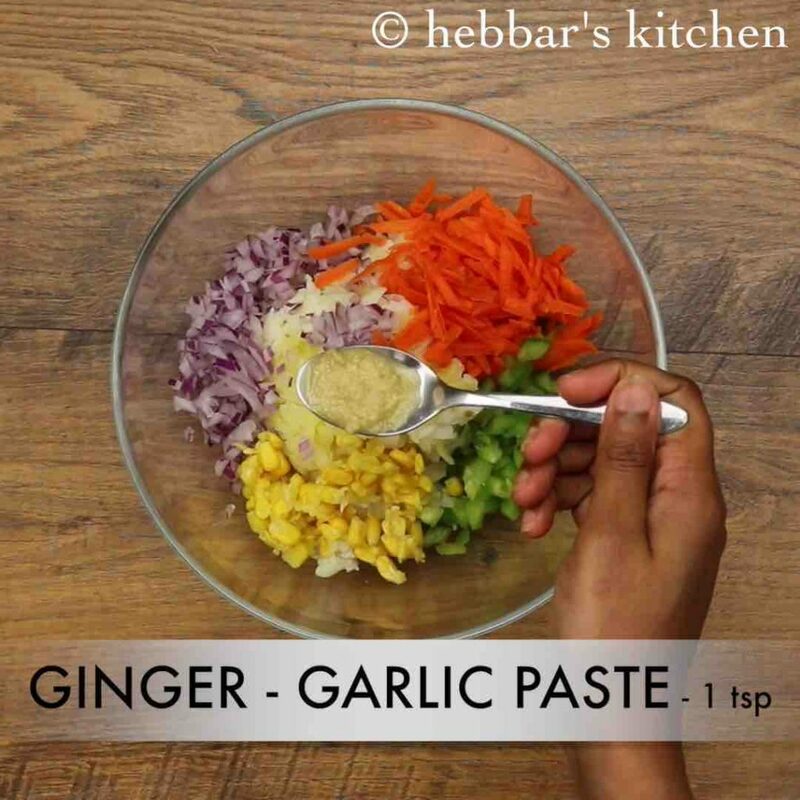 also add 1 tsp ginger garlic paste, 1 green chilli, 2 tbsp coriander, ½ tsp salt and 1 tsp soy sauce. 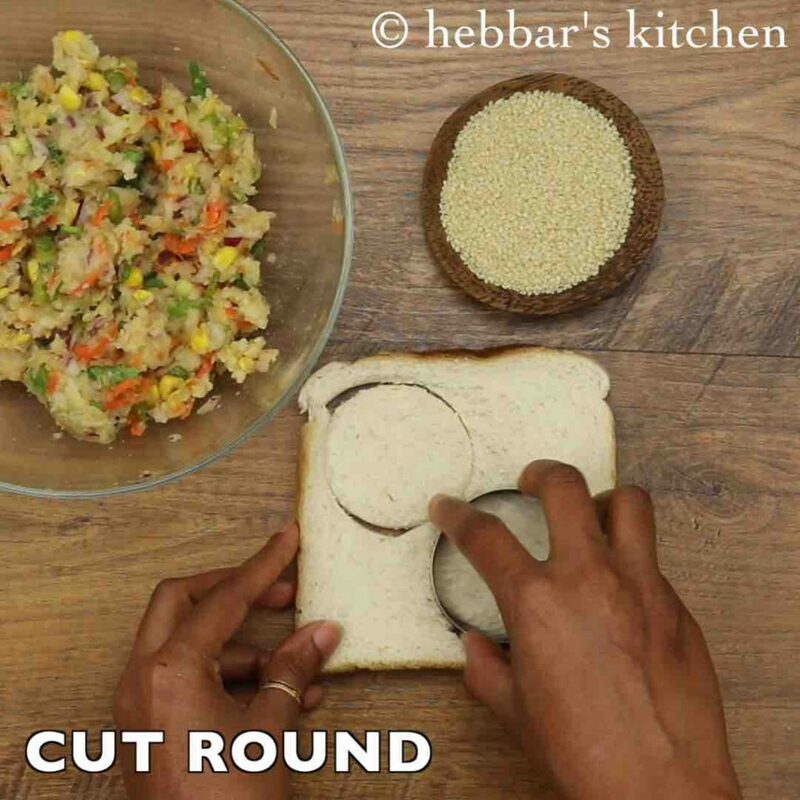 now using a round shape cookie cutter or glass and cut bread slice into round pieces. top with a tbsp of prepared aloo mixture. coat with sesame seeds over aloo mixture. 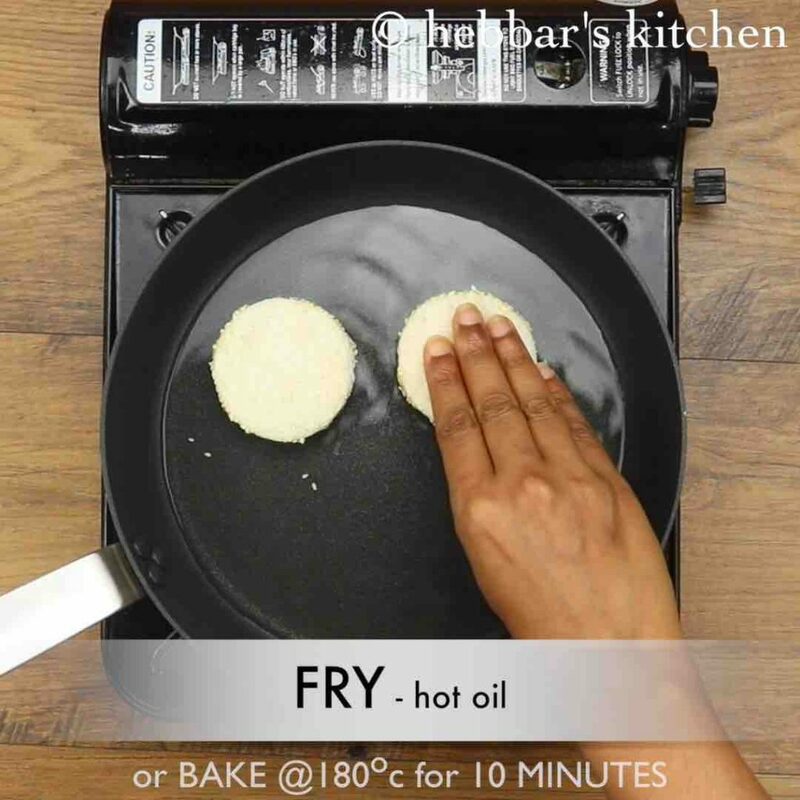 now shallow fry in hot oil or bake at 180 degree celsius for 10 minutes. 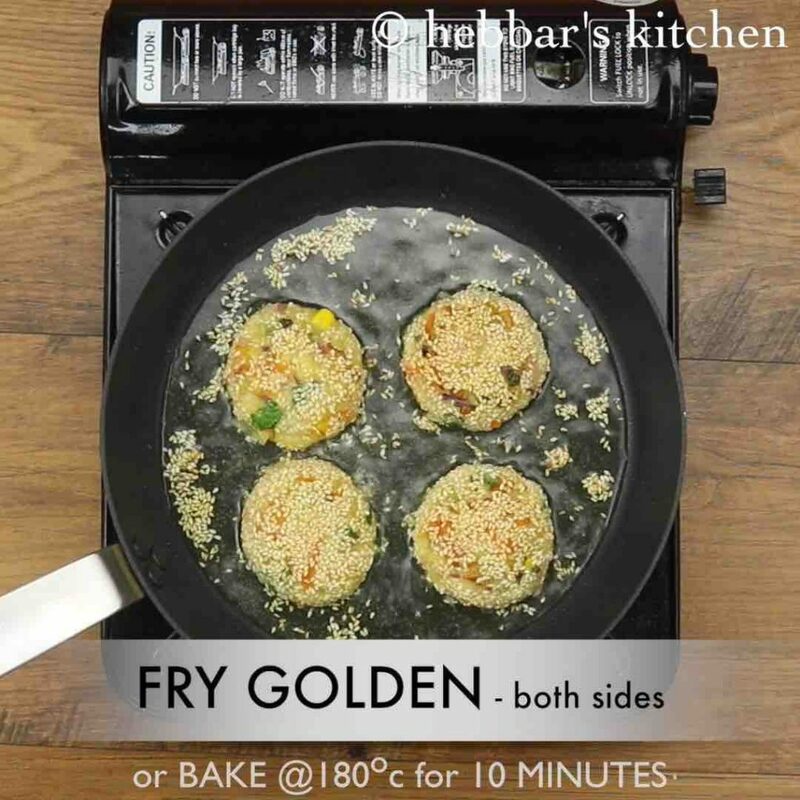 flip over and fry till the gold coin turns golden and crisp. finally, serve veg gold coin with tomato sauce or green chutney. 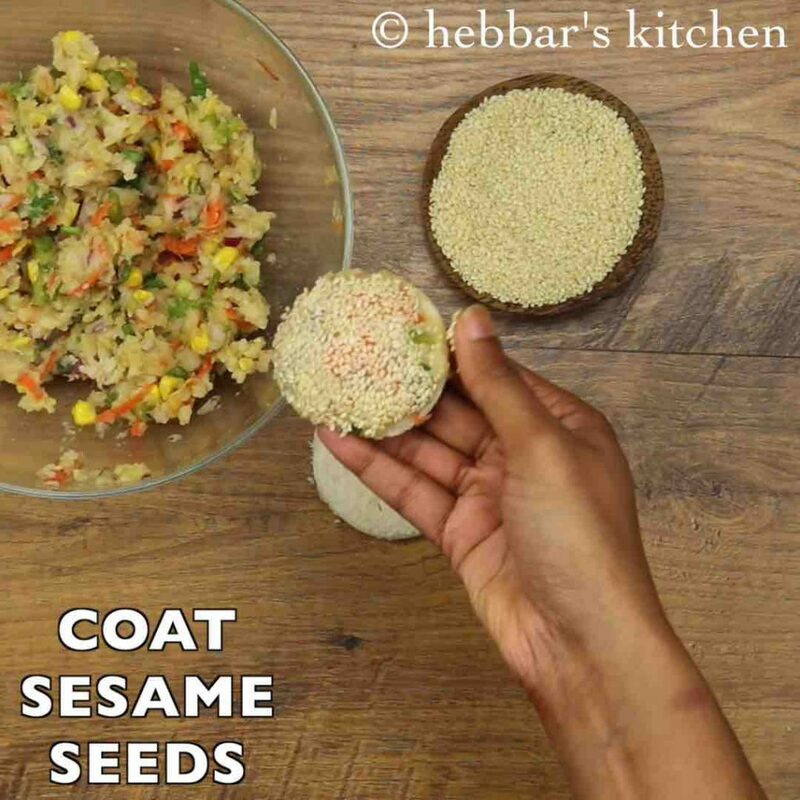 coat with sesame seeds over the aloo mixture. 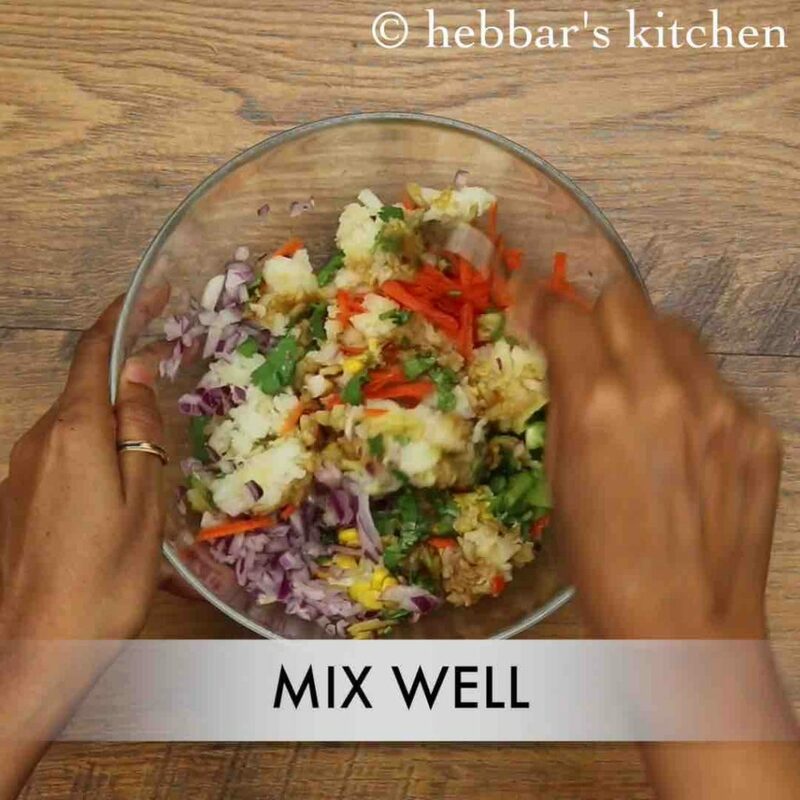 firstly, add vegetables of your choice to make aloo mixture more healthy. also use fresh white or brown bread for more tasty gold coin. additionally, fry the gold coin in hot oil, else bread will absorb oil. finally, veg gold coin recipe taste great when served hot and crispy.